Bonjour et happy MLK day! Having worked in the U.S. for many years, I have become quite familiar with the « system » and made the best of the small benefits companies are usually able to give when it comes to vacation or unpaid time off. My family in France is always surprised and feels like I ambeing « exploited » when I explain the standards here (2 weeks off vs. 5-7 weeks off after 1 year of employment). However, I believe that you can make the best out of what you have and that it makes you a more competitive employee internationally compared to a French worker with numerous benefits and high taxes tied to their employment. 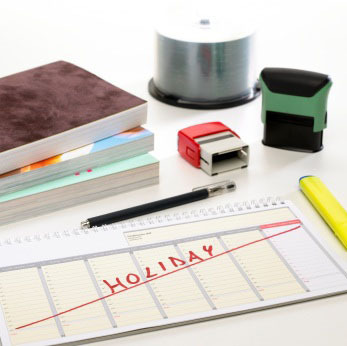 Everything has a price… If a company gives you more paid time off, they will also have to reduce your salary. Basic maths. J’ai pu demander un congé autorisé de 30 jours. // I was able to request a personal leave of absence of 30 days. Puisqu’il est engagé dans l’armée, il peut seulement demander une permission de 10 jours à la fois. // Since he is enlisted in the military, he can only request a leave of absence of 10 days at one time. Après 1 an d’emploi, Sophie aura droit à 3 mois de congés de maternité. // After 1 year of employment, Sophie will be eligible for a 3-month maternity leave. Combien de jours de congés payés souhaiteriez-vous demander pour cet été, Mme Dupont ? // How many days of paid leave would like to request for this summer, Ms. DuPont? J’ai du demander un congé sans soldes pour pouvoir visiter ma famille en France. // I had to request an unpaid leave in order to visit my family in France. Je vais pouvoir prendre 2 semaines de congés pendant les vacances scolaires de mes enfants. // I will be able to take 2 weeks off during my kids’ vacation. Acknowledge how happy you are in your current position, mentioning also the length of your tenure, and point out your recent achievements. Negotiate how much paid time off (Vacation) you can combine with an unpaid leave (Personal leave of absence); make sure you provide all relevant personal information too if you are requesting that leave in order to attend an important wedding or birth or funeral in your close family. This could qualify for FMLA (Family and Medical Leave Act). Express thanks, be accomodating and work extra hard to show your worth as an employee! I have been able to manage such arrangements in my different positions over the years, with only 1 that was combined with a change of employment. Mostly I have been able to take some vacation time, and then work remotely for a few weeks… Bonne chance! PS: You may have noticed that the audio files were not working properly in the inserted player (stuck on « buffering… »). This issue has been resolved and the mp3 format should work by clicking on play in the little player. Thanks for following le mot du bonjour! 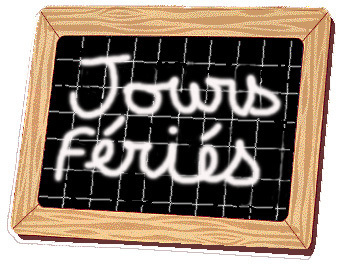 Learn to say « un jour férié » for Labor Day! Bonsoir and hope you had a nice Labor Day week-end! How appropriate that today’s « mot du (bon)jour » is in the « Travail » category. In France, Labor Day (la fête du travail) is always on the 1st of May. La fête du travail est un jour férié. // Labor Day is a public holiday. Même quand ce n’est pas un jour férié, les magasins sont souvent fermés le lundi en France. // Even when it is not a bank holiday, shops are often closed on mondays in France. Durant quels jours fériés la compagnie ferme-t-elle ses portes? // During which holidays is the company closed for business? J’espère que vous avez passé un bon jour férié aujourd’hui! Bonne nuit!